Anker’s SoundCore Spirit X headphones are the sportiest member of the SoundBuds family, and are designed with active users in mind. Their ear wings ensure they stay put while you exercise, and an internal hydrophobic coating means your sweat won’t fry them. Their best spec though? 12 hours of battery life, which is basically unheard of in the space. We’ve seen our fair share of USB power receptacle deals, but this model from iClever is the most affordable option yet. Half the things you plug in these days probably plug into USB, so it just makes a ton of sense to install these around your house. $10 is as cheap as these things ever get individually, but today, you can get a two-pack for $15 with promo code IC2A2U01. Just make sure you know what you’re doing. If you home has any ceiling mounts for lights or fans, you can install this gorgeous Philips Hue flushmount light for $175 today, or $25 less than usual. Unfortunately, it can’t display colors, but it can shift through various temperatures of white. For example, daylight when you want to feel energized, and warmer in the evenings when you’re trying to wind down for the day. We’ve already mentioned Nike’s wide-ranging extra 20% off sale, but one deal deserves a special mention: 20% off the excellent Apple Watch Series 3 with cellular connectivity, which hardly ever goes on sale. I’m not totally sure why promo code HOT20 works on these, since it’s only supposed to be for sale items, but hey, I’m not complaining. Don’t need cellular, GPS, or advanced waterproofing? You can still get a Series 1 Apple Watch for just $179 from Walmart. Update: You can now get a 75" Vizio for an all-time low $1,298 as well, complete with 32 local dimming zones and Dolby Vision HDR. If that’s a little out of your price range, here are some more great TV deals that Walmart is currently offering, including a 55" 4K TV for just $280. 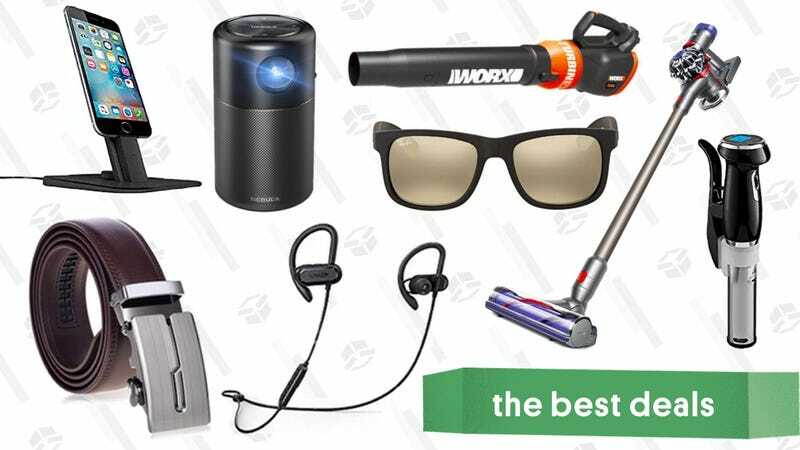 Update: All of these deals are still available, and still excellent, but we’ll add a mention of this 200GB SanDisk (a capacity that Samsung doesn’t offer) for $54. It was cheaper on Prime Day, but otherwise, that’s a very good deal. Is Amazon’s Fire HD 8 in the same ballpark as, say, an iPad Pro? Of course not. But $60 is an insane price for a tablet with a 1280x800 screen, 32GB of storage (with a microSD slot for more), and a 12 hour battery. If you mostly want a tablet for passive media consumption, or just want one for your kid, this is probably all you need. For context, the regular price for the smaller, 16GB model is $80, so you’re saving money and doubling your storage with this deal, if you can lock in your order in time. Smart outlet switches have become the atomic unit of smart home gadgetry, and you can get stock up on Etekcity models with Alexa support and even energy monitoring today. Just use promo code YEJ7ZTJV at checkout to get a two-pack for $17, making these the cheapest smart plugs we’ve ever seen. These are dark times we live in, but dammit, you can still take a bath to relax. This bamboo tray can expand to span your tub, and includes a cupholder, fold-up mirror, and more space to rest things like your Kindle or a scented candle. It’s only $25 with promo code OJTS4EC4, so go ahead, treat yourself. Simplehuman makes our readers’ favorite trash cans, and three different models have rare discounts today, including one that includes both trash and recycling compartments. They’re still not cheap, but they’re beautiful enough that you won’t mind having them out in your kitchen. Steaming your clothes might not get them as crisp as ironing, but it’s so much faster and, when you steam instead of dry clean, you can extend the life of your clothes. This Rowenta steamer is down to $34 from its usual $40 price. Unlike cheaper clothes steamers, this machine has a 6-foot power cord, 45-second heat-up time, and comes with a fabric brush for heavier fabrics and steam bonnet for delicates. Summer isn’t over yet and if you think you’ll squeeze in a few more days at the pool this season, you should buy a 3-pack of these drink floaties. The swans, rainbows, and donuts are all only $5 for a 3-pack, so what are you waiting for? Snag some new luggage from this Delsey Helium Woot sale. They have two carry-ons, a 25", and a 29", so you’ll be able to find the right size for any trip. These lighweight, hardsided suitcases expand an additional 2 inches for all you overpackers, and have four spinner wheels for easy maneuverability. This sale will end at the end of the day or when the products sell out, so grab them before they’re gone! Chemical Guys make some of the most popular car detailing products on the market, and Amazon’s currently taking 20% off several soaps, waxes, tire and glass cleaners, and more today. They’ve been running coupons on their cleaning products relatively often, but today’s sale also includes some of their popular cleaning supplies for boats too. Just note that the prices listed on this page don’t include the discount, but you’ll be able to see the discount at checkout. 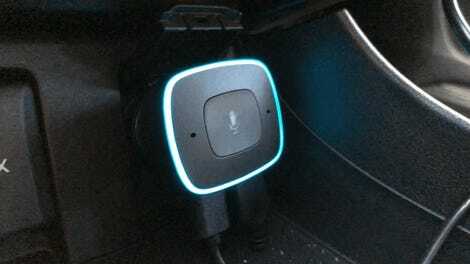 Love Alexa, and wish you could take her with you on your commute? Anker’s running a $14 discount on their hands-free, Alexa-enabled car charger today with exclusive promo code KINJASCC. designed one. Lifewit describes this as a casserole dish carrier, but really, it’s just a picnic bag or lunch box, though I suppose it could hold a small casserole. But whatever you put in it, it’s attractive, insulated, and only $13 right now with promo code K3G7DU2G. Halloween’s still a few months away, but let’s be honest here, there’s never a bad time to dress up your pet. Pet Krewe is the company that made the dog lion mane featured in this Amazon ad—hey, who’s chopping onions in here?—and our readers can save 25% on every costume they sell right now with promo code GDAG23DC. Pictured above: Miller, our coworker Zach’s dog sporting the classic dog lion mane, and Garrus, my cat, rocking the feline version. They didn’t send us the dog spider to test, but that would be perfect for Halloween. Just be sure to head over to Pet Krewe’s Amazon store to see all the deals. Vacuum-insulated bottles can keep drinks hot or cold all day long, and Hydro Flask makes some of the most popular options out there. REI has discounted a few colors of their 22 oz tumbler to just $15, that’s a good chunk off from the usual $30. This sale will end on Monday and it might sell out early, so grab one before they’re gone. If you own an Instant Pot, and I know for a fact that a lot of you do, this $19 kit (with promo code KINJA35OFF) will let you use it in a few new ways. You get a steamer basket, an egg bite mold, and two oven mitts, all made from non-reactive, easy-to-store, and dishwasher-safe silicone. Update: Working again, if you missed it yesterday. This RGB lamp from Aukey is ostensibly meant for bedside use, but with a rechargeable battery and a hanging strap, you could use it in your yard, at a campsite, on your patio, or anywhere else where light is scarce and power isn’t readily available. Get it for $17 with promo code AUKEYS10. While its grip might not be quite as secure as a perfectly-sized socket, this Tacklife universal socket can get a good-enough hold on almost any bolt, not to mention oddly-shaped things like hooks, without taking up a ton of space in your tool box. Get it for just $6 with promo code ECQG7Z4L. Anker’s home goods brand, Eufy, put its uber-popular copper string lights back on sale today for $10, one of the best prices we’ve seen on the version that includes a remote. Go make your patio pretty! If your tires are due for a replacement, you can get up to a $100 rebate (in the form of a prepaid Visa card) this month by buying a set of four General Tires. Just check the list of eligible titles here (also embedded below), buy your tires, and submit your rebate online for the fastest processing. I did a similar deal a couple months ago through Discount Tire, and my advice is to immediately use that prepaid card to buy something easier to use like an Amazon gift card. Lou & Grey used to be a humble section of Ann Taylor that has now exploded into its own great brand. I’ve written about how much I love the brand, and right now they’re giving you a 30% off select summer favorites, plus free shipping. There’s a lot to choose from (82 items to be exact) so it’s gonna be hard not to fill your cart with many, many things. Warmth on demand isn’t just science fiction anymore. Polar Seal clothes give you the ability to add even more warmth to your winter layers with built-in warming elements, powered by any standard USB battery pack. The two heating zones and three heating levels are controlled by the waterproof buttons on your wrist. With a 5,000 mAh battery, it’ll get you around four hours of heat, and a 10,000 mAh battery will bump it up to eight. With their launch of three new styles, a hoodie, a vest, and a parka, you can outfit yourself in heated layers from bottom to top. All three styles are water-resistant and you can preorder them now through Kickstarter and automatically save up to $150. TriggerPoint’s peanut-style double massage roller is designed to curve around your spine to massage your back muscles, and you can even adjust its length to target different muscle groups. It’s small enough to throw in a gym bag, and at $17, it’s never been cheaper. Soon, you’ll be thinking about layering and wool socks (I promise). But right now, Columbia is giving you 50% off select styles, no code needed, during their Summer Sale. Choose from over 1,000 styles for everyone. Pick up layering pieces, rain shells, t-shirts, and outerwear that’s perfect for the fluctuating temperatures, for a lot less than normal. Plus, Greater Rewards Members get an extra 20% off sale items. Update: Get your orders in this weekend, this sale ends Monday! If you missed last month’s Audible promotion, you can snag this Groupon for a 2-month subscription (a $30 value) for just $2. That’ll get you one free book per month and 30% off any additional books you buy. If you’re not sure you’ll use it, audiobooks make road trips and long commutes about a thousand times more enjoyable, and for just $2, it’s worth checking out. This deal is exclusive for new Audible subscribers. After the 2 months are up, you’ll be billed $15 per month. You can cancel the subscription at any time. Mark Bittman, the author of the super popular How to Cook Everything, has written a sequel that focuses on just the fundamentals of cooking. It’s a book with over a 1,000 photos to show you step-by-step directions on how to test doneness, crimp a pie crust shut, crack an egg, and buying better seafood. How to Cook Everything The Basics is just $3 today, so download it before this deal gets gobbled up. In the year 2018, Xbox One controllers still, inexplicably, don’t have rechargeable batteries built in. Luckily, it’s a pretty easy fix with these affordable kits, which include a charging dock and two battery packs that slot into the AA battery compartment on your controllers. Beyond the color difference of the two models, the black, $17 option includes 1,200mAh batteries, while the white one bumps you up to 2,000mAh. Just be sure to note the appropriate promo codes for each. As far as I’m concerned, the Switch port of Rocket League is up there with fire and the wheel in terms of greatest inventions of all-time. The ability to play a few rounds in the palm of your hand just makes it that much more addictive, and don’t get me started on Samus’s gunship car. Download it for $14 today, or $6 less than usual. The Commodore 64 Mini finally comes out this October, and while shortages aren’t guaranteed like they would be for, say, a new Nintendo Classic mini console, it never hurts to preorder. The half-sized scale model C64 Mini includes 64 games onboard, with the ability to add your own as well. Lock in your order now for $80, then drop your favorite C64 game suggestions in the comments below.